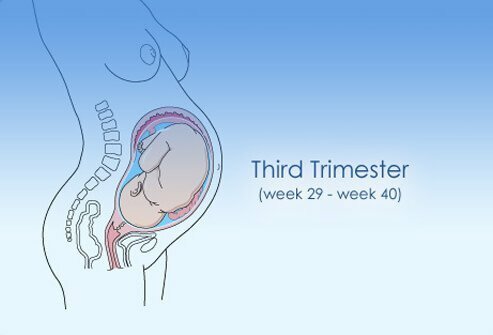 In the third trimester of your pregnancy you might start feeling like you’re going to pop. Don’t worry I promise the end results are amazing. Some symptoms you might experience are swelling and not just the belly. My feet started to swell and I ended up dealing with the worst carpal tunnel ever. I already had it but it got ten times worse at the end of the pregnancy. Here are some more symptoms that you might experience in the third trimester. Braxton Hicks Contractions – I really don’t know what these even feel like cause I apparently skipped that. My water broke three weeks early I believe due to stress. Heartburn – Oh Mylanta is right I had heartburn like crazy and unfortunately when you are pregnant you are limited on what you can take. Tums were my best friend during the last few weeks of my pregnancy. The myth is though the more heartburn the more hair the baby will have. I’d say this to be true because I had heartburn like crazy and my daughter came out with a lot of dark hair. Now she is blonde. Frequent Urination – I had to go every 5 minutes because baby girl would constantly be sitting on my bladder. When my water broke my first thought was “I must have really had to pee.” But this is also common in the first trimester as well. But it does get a bit more frequent towards the end. Back and Hip Pain – I had the worse pain ever more in my lower back than anything. Best thing to get to help relieve this is a pregnancy support belt. That help me wonders to get through the last few weeks of the pregnancy.